There is nothing like a fresh, home grown Tomato. 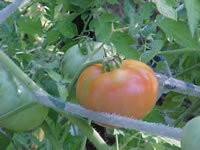 Tomatoes are one of the most satisfying and rewarding plants that you can grow in your home vegetable garden. They are easy to grow and produce a bountiful crop in a relatively small area. you should starts seeds indoors early or buy nursery grown plants. planted in the garden until all danger of frost has passed. nor should they be planted where Tomatoes were grown the previous year. except in hot summer regions where they should have some shade in the hottest part of the day. Insufficient sunlight will cause straggly vines and fewer, smaller fruit. in a generous amount of compost and/or well rotted manure. Test and adjust the soil acidity to maintain a pH of 5.5-7.0. 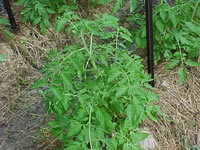 New Tomato plants can be propagated by using side shoots as cuttings. Remove any flowers or buds, as well as the lower leaves. Dip the cutting in rooting hormone, and plant it directly in the garden in full sun, where it is to grow. Strike the cutting deep enough that the top cluster of leaves is just above the soil line, but not in contact with the soil. and place it over the cutting to act as a greenhouse. New roots will begin to form all along the buried stem within a week or so. In areas with warm springs and long growing seasons, Tomato seeds can be sown directly in the garden as soon as the danger of frost has passed. so it pointless to plant them before the temperatures warm up. Start Tomato seeds indoors 6-8 weeks before the last killing frost. Sow Tomato seeds ¼" deep in trays or cell packs filled with potting soil. Maintain a temperature in the growing medium of 70°-75° until germination, which takes 5-8 days. and kept ia a warm, bright, well ventilated area until it is time to move them to the garden. Plant Tomatoes two inches deeper than they were growing at previously! A late, unexpected frost will destroy your Tomato crop, so for the first couple weeks after planting you should keep some five gallon buckets, tenting material or hot caps handy to cover your Tomato plants in case the unthinkable happens!